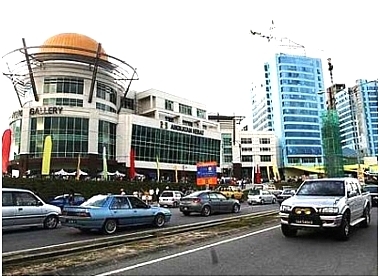 Original posting with correction: Borneo’s largest megamall, 1Borneo — which at 139,354 sq metres is 345 sq m larger than VivoCity, Singapore’s largest and newest shopping centre — is opened in Kota Kinabalu, the capital city of Sabah, the Malaysian state on north Borneo. [Photo: The Star] If my calculation is right, 1Borneo is the third fourth largest hypermall in Malaysia after Berjaya Times Square (700,000 sq m) in KL, One Utama Shopping Center (464,515 sq m) and Mid Valley Megamall (420,000 sq m), also in KL. In fourth fifth place will be Suria KLCC at 139,000 sq m, which is about the size of Singapore’s VivoCity. Sabah, a regional shopping destination? Sabah Chief Minister, the Right Honourable Musa Aman, launched the soft-opening of the mall yesterday, saying the newest facility had the potential to place Sabah among the top regional shopping destinations. 1Borneo among others, has four international chain hotels, condominiums, an Auto City, oceanarium and Discovery Centre, handicraft cultural centre and a cineplex among others. Anyway, the cropping up of new shopping malls are of little cheers for me nowadays. Shopping is not fun anymore with all the rising costs. I bet it will be crowded with PTI. Any guitar stores in it? Sunsuron: Ya, spoiling the facility.. hopefully the mall will be made more “up market” so that the PTI will really be out of place there..
GLA – the area of interior floor space leased. Roy, ya gross lease area is another way of looking at the size of the malls. Thanks for the figure… Ya, this entry should have looked at the size from various angles, and you’ve provided one of the angles. any job vacancy for managment? you can try. obviously news business opens up a lot of other opportunities. Next post: Project Petaling Street Blog Portal Is Dead?